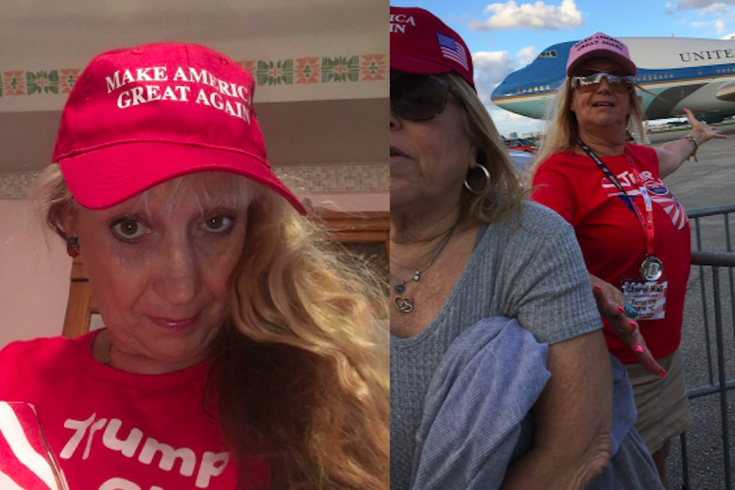 Cheryl Hall questions why rules prohibited her from wearing a 'Make America Great Again' hat in her driver's license photo when other women were permitted to wear religious headscarves. Dating back to before the turn of the century, I’ve often worn a Chicago Cubs hat atop my head. It’s not that I dislike my hair. My hair is good hair. It's just that I like wearing that lid when I can. It's more habit than fashion statement. Before their November miracle, it was an emblem of support for a team that would seemingly never win it all. Though redemption miraculously foundeth the Cubbies, that blue lid could never be considered religious garb. As such, I didn’t bother trying to wear it in my driver’s license photos. In fact, the thought never crossed my mind. That would just be silly and beneath what’s expected of respectable, contributing members of American society. Why am I telling you these seemingly nonsensical “fun facts”? A story emanating from Clermont, Florida brought it all to mind this rainy Friday morning. In late March, the TKAG committeewoman went to Florida’s version of the DMV to get her new license photo taken. For that birthday shot, she placed one of those tacky, red "Make America Great Again" hats atop her blonde locks. Playing by the rules and regulations of that state, the employee asked Hall to remove it. That’s when Hall turned into an aggrieved snowflake, er, victim who wanted to do nothing of the sort. "I said, 'Why do I have to take my hat off, when I see a young lady over there with a veil covering around her face?' I didn't understand that. So she said to me, 'That's her religion.' I said, 'If that's her religion, this is my religion!' And she said, 'Well, we do have regulations with the statutes.'" By there, I mean Hall likened her support for a presidential candidate who lost the popular vote by millions to a hijab (or headscarf) traditionally worn by Muslim women for religious purposes or social customs. And by there, I mean calling Hall’s response ignorant would be a watered-down declaration. While that happened in March, the “issue” – akin to a 2015 battle in California where someone wanted to wear a U.S. Marine Corps hat after seeing Sikhs in turbans – has festered throughout April. At first, the state relented, allowing her license photo to include that hat which – to reiterate – is a really tacky campaign gimmick. It becomes a sad reflection of what this increasingly isolationist nation's become in the age of vilifying "others." The victory was logically rolled back within weeks when DMV superiors in the state capitol revisited that policy and decreed that Hall needs a new photo – sans hat. Listen, I get it, political tensions are running high as divisions amongst Americans grow wider. Hall’s words are beyond the pale, though. That she defended her right to wear (did I mention it’s) tacky Boardwalk-quality gear by dismissing a garment with religious pertinence and importance is patently, and ridiculously, offensive. Political support does not, and should never, qualify as a religious statement, just like sports fandom doesn’t. Hall's quote belittles a religion practiced by more than a billion people across the globe. It's wrong. It's dismissive. And, upon realizing that people will have her back in this battle, it becomes a sad reflection of what this increasingly isolationist nation's become in the age of vilifying "others." Oh yeah, in case you were wondering, there are rules in Pennsylvania regarding headwear in driver's license photos, too. Like Florida, we have a religious exemption insofar as they're not going to make Muslim women take off their headscarves. I'm out of luck if I want to wear my Cubs lid, though, as hats aren't permitted. But don't worry, PennDOT, I'm well enough adjusted that I won't kick, scream and play the whiney martyr over it.